What is the corrected magnesium? What is the magnesium correction for albumin formula? How to calculate corrected magnesium? When should I suspect hypomagnesemia? 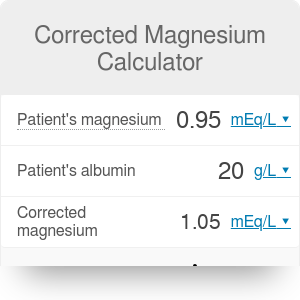 This calculator will help you get a corrected magnesium level in a patient with low albumin (hypoalbuminemia). In the further text, you will discover why do we should perform magnesium for albumin correction, how to do it, and, for inquisitive readers, what the formula looks like! You will need only the lab results of the patient’s serum magnesium and albumin level. Magnesium plays a crucial role in our bodies. It works as a catalysator of many processes, enables the contraction of cardiomyocytes and stabilizes platelets in our blood. The physiological magnesium concentration in human serum is around 0.65 – 1.25 mmol/L. A lower magnesium level is called hypomagnesemia. 70 % of serum magnesium is in a free, ionized form of Mg2+ cations, the other 30% is bound with proteins, mainly albumins. The serum magnesium level test measures 100% of serum magnesium but only the first, free-form, is biologically active. In other words, solely the deficiency of the first form may cause clinical symptoms as listed below. It leads us to the problem of false hypomagnesemia that can be present in patients with low albumin level (hypoalbuminemia). Low albumin level decreases the amount of magnesium bound with serum proteins, causing lower results of the serum magnesium level test. Our calculator will help you correct the serum magnesium level in a patient with hypoalbuminemia. It is also worth noting that the serum magnesium level does not reflect its intracellular level and there might be a deficit of magnesium in our body even when the serum magnesium level is in a physiological range. There are many other examples of certain biological conditions altering lab results. To learn more about it, please check out our sodium correction and corrected calcium calculators. Although there is no general agreement on how the magnesium correction for albumin should be achieved, the following equation has been proposed by Martin H. Kroll and Ronald J. Elin and published in an article from 1985 titled: “Relationships between Magnesium and Protein Concentrations in Serum”. Insert the patient’s lab result of magnesium level in the Patient’s magnesium field. Please notice that the unit of mEq/L can be used interchangeably with the mmol/L. Type in the patient’s serum albumin level in a unit of your choice (usually g/L or g/dL). Our calculator will perform magnesium correction for albumin for you! Just write down the result from the Corrected magnesium section. The most common symptom of hypoalbuminemia is a generalized edema, caused by the low oncotic pressure of blood. In all of these cases, serum magnesium level test should be considered during a diagnostic process. Corrected Magnesium Calculator can be embedded on your website to enrich the content you wrote and make it easier for your visitors to understand your message.